How does the search tool work? We constantly refine our search algorithm to give you better results. Titles that relate to your search show up as a list, sorted by title, author, or date (as you prefer). If a specific page images are returned as a result, they will show up in a gallery underneath the titles, and can be sorted by title, author or date (as you prefer). How can I make my search more specific? The search engine will find results for each word that you type into the search form. Surrounding a specific phrase with double quotation marks will restrict the search to only that phrase, and will not return results from the individual words. How do I use the page viewer? Most typical trackpad/mobile gestures will work on the Codex Rare Books page viewer. If you are still not able to navigate, read on. How can I navigate between images? You may click on a thumbnail to go immediately to that page, or click once to advance to the next page in the set. You can also click on the ‹ and › icons, or use the keyboard arrows to advance back and forth throughout the set of images. On a mobile device, simply swipe left or right. How do I zoom in (and out)? Either use the zoom icons, or double-click on the page image itself. On a mobile device, use the pinch-zoom gestures. Use a two-finger swipe to move a zoomed-in image within the viewing area. On a mobile device, dragging a single finger does the trick. How can I scroll through the thumbnails? You can either use the scroll arrows, or a two-finger swipe to move the thumbnail scroller left-to right. On a mobile device, dragging a single finger does the trick. How can I show or hide the textual information? Click the icon with the close-quote mark (”) to hide and show this information. Is there a full-screen feature? How do I close the viewer? Simply click on the icon with the “X” to return to the title information page. We work every day on serving the pages to you faster, but the fact of the matter is that we are delivering huge images and they do take a few moments to load. Titles with over 200 page images may take a few more moments again to load fully. We will continue to improve the speed of download; however, we do prioritize quality over speed. Your browser's page caching system will help to speed up pages that have previously loaded. How much does a Codex Rare Books subscription cost? A single-household monthly subscription costs $8.95 USD. A single-household yearly subscription costs $98.95 USD. The subscription is handled by PayPal, and automatically renews. How much does a Codex Rare Books institutional subscription cost? An institutional monthly subscription costs $24.95 USD. An institutional yearly subscription costs $274.95. The subscription is handled by PayPal, and automatically renews. You get full and complete access to our complete and constantly expanding catalogue of over 838 rare book titles (growing daily). Access includes high-resolution images of key pages and in-depth data regarding the title’s provenance, historical importance, economic history, printing record… not to mention complete bibliographic information. This information too is continually being improved, updated and expanded. New subscribers to Codex Rare Books will automatically enter a seven-day free trial assessment period. If you choose to cancel your subscription before the end of the free trial period, you will not be billed for the service. When you choose to stay with the Codex Rare Books service, your credit card or PayPal account will be charged automatically after the seven days are up. Go here. After you create a new account, you will still need to subscribe to gain full access to our complete catalogue of titles. How can I subscribe to full access to Codex Rare Books? If you already have an account, you can subscribe here. How can I obtain my invoices? You can find detailed invoices for each of your payments at your Payment History page. Find the link to your payment history on your account page. Your Codex Rare Books subscription is handled by our card-processing banking partner and complies with all (PCI) standards. Your subscription automatically renews. If you wish to cancel your subscription, then go to your Payment History page and click the cancel button. Find the link to your payment history on your account page. Note that cancelling your subscription does not delete your account, and you may re-subscribe at any time you wish. If you wish to switch from a monthly to a yearly plan – or vice-versa – then simply cancel your current plan and re-subscribe to the plan of your choice. How can I contact Codex Rare Books? Some specific pages will lead to directly to our contact form. If you need to get in touch with us for any other reason, you will find the contact form here. Will you spam me, or send me unsolicited electronic mail? Emphatically: no. The form information is repackaged and sent directly to Codex Rare Books as an email. Codex Rare Books does not save any data from this form or email in any online database or shared media. Replies will only be to you and only by email or the contact method you request. They will never be used for unsolicited sales (spam). Codex Rare Books shares your information with absolutely no one. How can I be sure my information is protected? 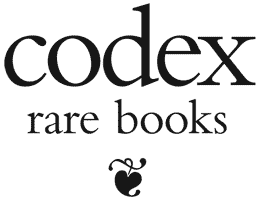 You can find all of Codex Rare Books’ Privacy and Legal Statements on this page.